The perfect dish for your Passover Seder meal. (The Nosher via JTA) With Passover comes lots of cleaning, matzah eating, and potato peeling. I know, I know — potatoes get a bad rap during Passover because they’re one of the seemingly few things we can eat (and therefore are made very frequently during these eight days). But I say don’t fight the potatoes. Embrace them! They’re cheap, they’re easy, everybody likes them and they really are delicious. 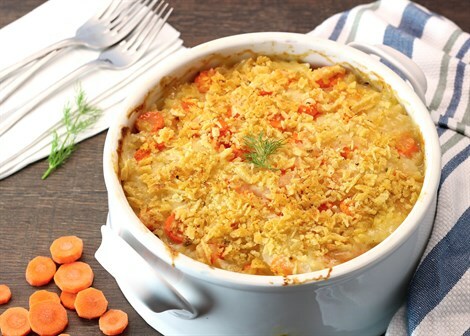 This Potato and Carrot Gratin recipe is the perfect side dish for your Passover seder. It’s got tender potatoes and carrots surrounded by a luscious, creamy sauce that you won’t be able to get enough of. Top it off with just the right amount of crunchy, salty potato chips and you’ve got yourself some seriously heavenly potatoes. Besides being a total crowd pleaser that your family and guests will love, it also looks quite stunning with the nice layers of potatoes and carrots. If you make a Potato and Carrot Gratin, your family will definitely not be complaining about another potato dish. I promise.